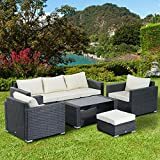 This 7pc Rattan sofa set is made up of 2 single seater with armrests, 2 corner seaters, 1 seater without arms, a table and a footstool. It is made of an aluminum frame and covered with PE rattan. The table is topped with a 5mm transparent tempered glass to place items. And the footstool can be used also as a spare seating if required. The set comes complete with cushions and some throw pillows. This is a great set to have in your garden, patio or conservatory. • Sturdy and stable construction for long lasting use. • Cushions for added comfort. • Tea table with 5mm transparent tempered glass. • Suitable for outdoor garden, Patio or conservatory. • Polyester cloth is fireresistant. Ideal for family camping trips this summer, this large camping storage unit is perfect for storing food and drinks and cooking equipment. 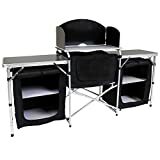 Featuring a central table with a windshield for protection whilst cooking and enough space for a cooking stove, there’s also two more table surfaces on either side to prepare your meals. Designed with 5 handy storage compartments to store food and cooking equipment, the units are finished with mesh panels for improved ventilation. 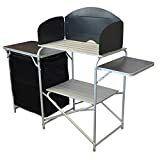 Crafted from a strong and durable aluminium frame, this large folding camping storage unit is easy to assemble. When not in use, the unit easily folds down and can be stored away in a black Oxford carry bag, for compact storage. Please note: Maximum loads vary. Middle table – 40kg, left and right table – 30kg. 22/19mm aluminium tube frame with matt finish. Large table top to fit stove. 2 handy storage pockets. 2 built in shelves in side cupboard. Built in shelf under kitchen unit. Removable side shelf on kitchen unit. Oversized carry bag.